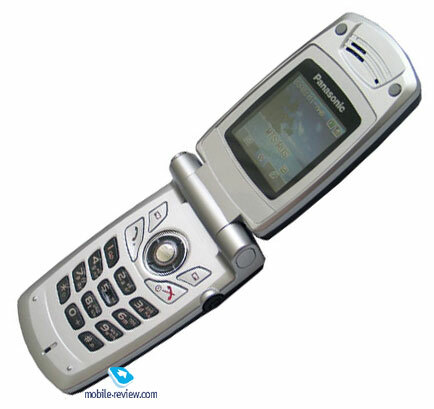 Panasonic has concurrently released several similar phones, including A500. The distinction from the older X400 consists of a camera lacking and removable front panels presented. 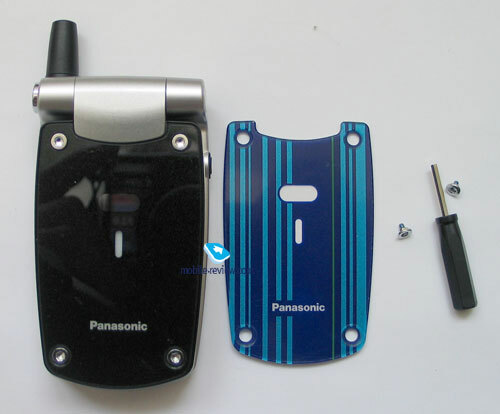 The model is provided with a special screwdriver that helps in removing a black glossy back cover of the phone with another. Besides a painted back cover, the kit has a usual transparent back cover and you can cut out and put your picture under it. A500 is equipped with an automatic opening mechanism. 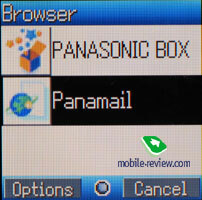 In contrast to Samsung models which were the leaders in Europe and were equipped with a special engine responsible for opening and closing the phone, Panasonic applies mechanics and the device like makes the upper part go off. Closing is naturally done manually. 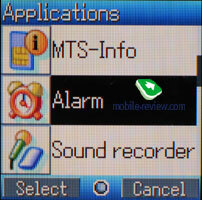 A special button on the left top end of the device is intended for opening. The thing that frightened the most was a possibility of accidental opening but having dealt with the device I realised that menace is absent. The key press takes some effort that you certainly won't notice in everyday life. The mounted opening mechanism puts some limitations on the work with the phone in a traditional way. When opening the device with your hand, you will have to deflect the upper part strongly for a complete opening to take place. If you do not do that, the upper part will open for about 90 degrees and will fix in this position. As for me, the best way is to use an opening key. If to shake the device in a closed mode, you will hear the opening key moving and that is a shortcoming of the assembly. The quality of the plastic is average and characteristic for its class. The presence of a glossy front panel makes the device look nobler and more expensive. The disadvantage of the panel is that it gets dirty just from the first minutes and finger prints stay on it. And this disaster is impossible to contend with. 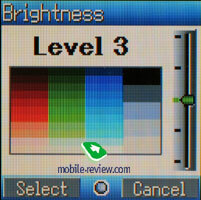 There are three colour solutions provided; they differ in the colour of the front panel and the back part of the phone. Thus you can find a white or a yellow device besides a black one. There is an IrDA gap on the front panel. 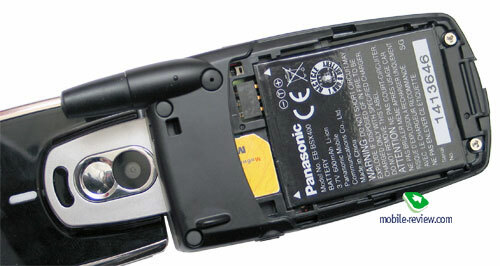 This disposition of the IrDA gap is not quite traditional and is characteristic for only Panasonic devices. Though it seems well-taken for short data transmission seances. A service indicator is also on the front panel. 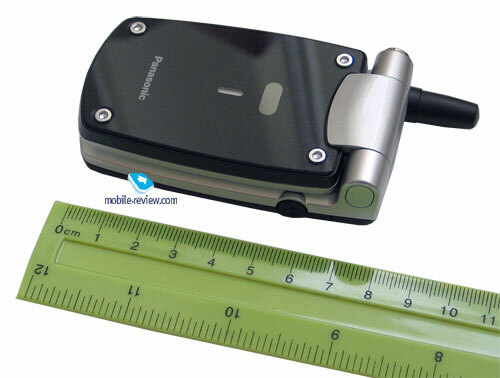 The device has the dimensions of 84x47x17.5 mm and weight 84 grams. You can carry the device as you like and the back part is of a dull black plastic. There is a headset connector on the right side surface. A charger connector is on the bottom end. Plugging a cable is not allowed in this device. 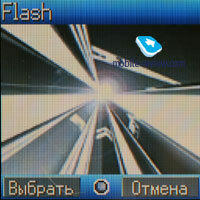 Having opened the device you will see a 65K TFT screen. 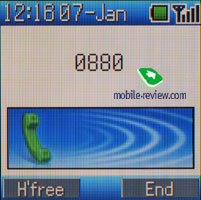 The resolution is 128x128 pixels (28x28 mm) and that enables showing up to 5 text lines and two service ones. 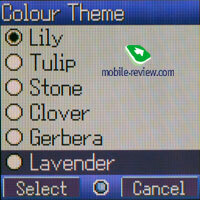 The screen is not bad as for the picture quality and the colours are bright. 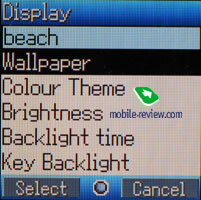 Subjectively the screen is comparable or a bit better than the ones similar 65K in Nokia phones. 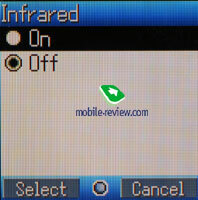 And comparing the screen with Siemens CFX 65 and Motorola v220 we may surely say it is better. 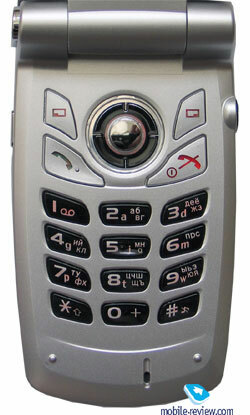 The keypad is made of plastic; the navi button with an integrated OK is comfortable. Number keys are in black, small in size and deeply sunk into the body. 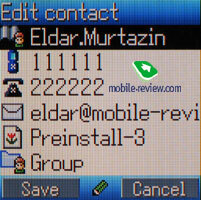 That makes no problem while entering a number, but when typing a short message one sometimes touches the body. Localised versions have a great disadvantage, the symbols of the two languages are absent, since there is too little place for all them either on the buttons or between them. For example, in Russian version all the Cyrillic symbols are inscribed; as to Latin ones, only the first symbols are remained. The back cover having no backlash hides a 600 mAh Li-Ion battery. According to the manufacturer, it may work for 75 - 210 hours in the standby mode and from 1.5 to 4.5 hours in the talk mode. In the conditions of Moscow MTS network the device has been working for about three days in case of 45 minutes of talks and up to 20 minutes of using other functions. We should say the change of a battery icon is not linear. The indicator shows the full battery for the whole first day and then it will decrease fast even with little conversations. Full recharging takes about 2 hours. To set a SIM-card you should plug it in a corresponding connector and move up to the stop. That may be done not all the times, sometimes a card touches a lug and then you will have to place it more thoroughly. 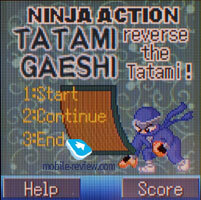 Entering the main menu is possible by pressing the OK button. 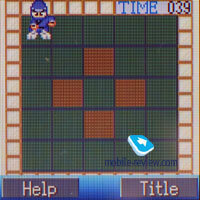 It is represented as a 3x3 matrix with a name of the selected item indicated in the headline. Submenus are shown as lists and an icon is placed to the left of the item. This fact makes the device look various and dealing with it gets more pleasant. Fast navigation is possible in all the menus, but you will not find a menu's number indicated, thus you will have to either remember the most important combinations or experiment every time. The menu with the most frequently used functions may be called by moving the navi button up. You may form this menu by your wish. 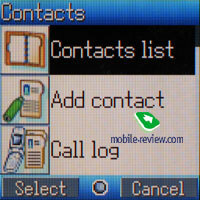 Moving down shows the contact list in the phone book. Horizontal moving is similar to using left and right soft-keys and that does not seem logical. The same realisation is present in Philips 568 that is also made by Quanta. Localisation is average; there is a word division, strange abbreviations. 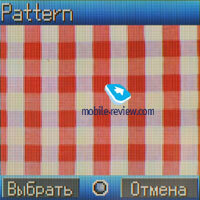 Predictive text input using T9 dictionary may be employed; there are dictionaries for Russian, English and Ukrainian. Unfortunately, the manufactures have not provided for Russian input in letters, so that becomes a not good tradition of Panasonic. Phone book. Up to 300 names may be saved in the internal memory, for a name you may have a Name (a field of 18 characters in length), a number (41 characters), a second number, an e-mail an address (48 characters), you also may select a picture (both from preinstalled ones or your photos) and choose one of the 9 groups as well. 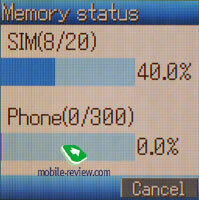 The total list shows both numbers from the internal memory and from the SIM-card. 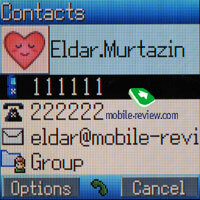 The device makes no difference between these types of numbers and there is no proper icon or other designisation. 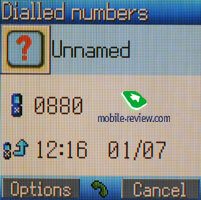 That may seem a disadvantage for those who got used to keep numbers not only in the internal memory but also on a SIM-card just as a backup. 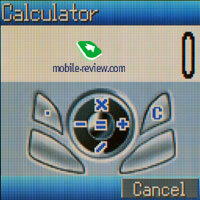 By the way, it is possible only to copy the numbers from your SIM-card to the internal memory, but not vice versa. 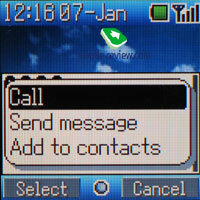 Groups do not provide any personal call melodies or pictures. 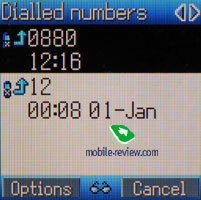 You may assign numbers for fast dialling to 8 number keys from the phone book menu. The call list is also here (virtually there are three separate lists). I liked the fact all the three lists are separated and moving between them is possible by shifting the navi button in a horizontal line. 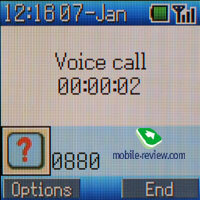 Each list contains up to 10 entries, time and date of a call. 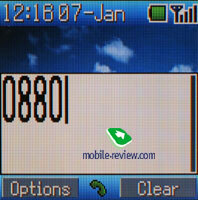 If the number is present in the phone book, the name and a corresponding image are shown. Separate entries of the phone book may be transferred to other devices via IrDA. Messages. 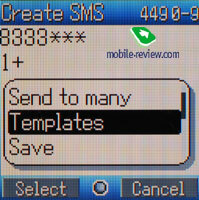 Up to 300 SMS may be stored in the internal memory. You may create own templates and use mass mailing lists (but you will have to select every addressee or type the number in, because groups do not work here either). 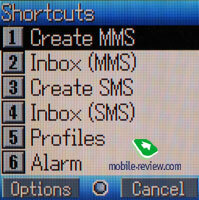 The device does not support EMS, but the presence of MMS lives it down though partly. The interface for entering a message is rather appropriate, yet the limitation on the size is 100 KB. 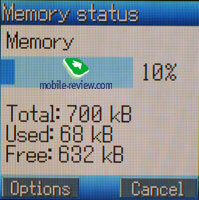 Up to 700 KB of memory are available for storing MMS totally. Calendar. 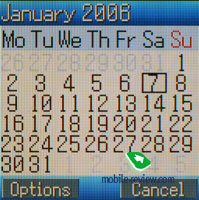 You may view up to 5 weeks at the same time, it is some kind of a calendar with fast shifting to the necessary date. Entering own events is impossible. WAP. 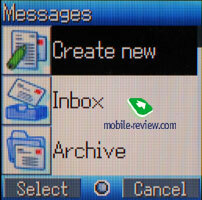 The device supports batch communications GPRS (4+1), wap-browser is of version 2.0. 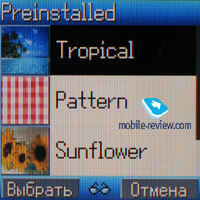 In general there is nothing to say about it, all the settings are preinstalled for Moscow operators. Applications. 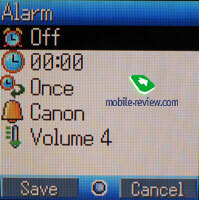 There is one alarm clock, but it may be set once as well as recurrent, a signal and its volume are possible to choose. IrDA. . The IrDA may be activated from this menu item. 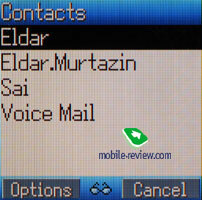 The phone can receive pictures, melodies from other devices, but cannot serve as a GPRS modem. Media. 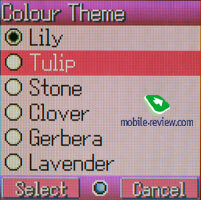 This menu item holds all the pictures, music and text templates, a general memory condition may be viewed from here. Games. There is only one game in the phone. That is Ninja Action. Uploading new games is possible only from Panabox site. Display. 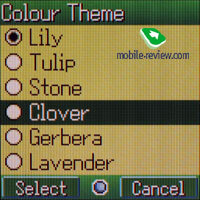 A user may select a screensaver (one of four pictures), a colour scheme for the menu (5 variants), screen brightness, backlighting working time and turn off keypad backlighting. 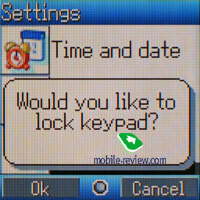 There is a keypad lock in this menu as well, but it is not very interesting in a clamshell form-factor. Other functions are standard; these are network possibilities and various security settings. 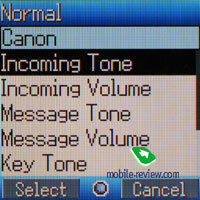 The phone has 16-tones polyphony and it sounds pleasant at the more. The volume of a call signal is often scanty, though monophonic signals are rather loud. The power of the vibrating alert is plainly low and it may be missed. 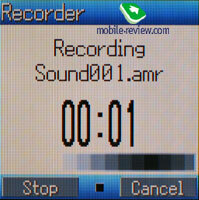 The device has no evident problems with the quality of connection and the volume of a loudspeaker. 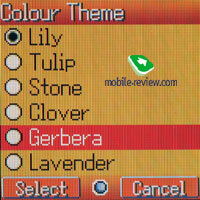 Sometimes frames fall on the zone edges, however that is characteristic for the majority of the phones. The opening mechanism is strength of the device, but it will not be a key one when deciding on buying the model. 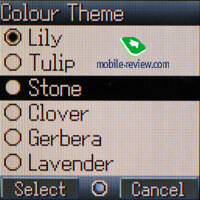 The phone attracts with design and the quality of the front insertion that masks all the rest. 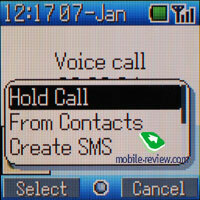 The device will suit those who need only calling and do not use any extra functions. An evident disadvantage is the fact uploading Java-applications is impossible, the lack of an organiser and presented functions are realised quite poorly. Today the price is about 185 USD. I am to repeat the conclusion drawn for X400, it is very identical one. That is not little for this functionality and the device is overpriced much. 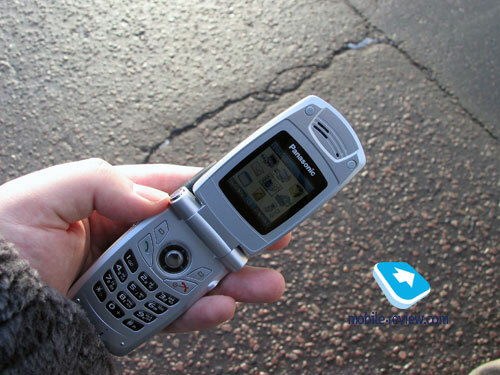 For instance, Motorola v300 wins almost in every parameter, except for the weight. But the price of this solution is about 80 USD less and that is really essential. We are grateful to Dixis for the provided phone.